Successfully Added World's Smallest Camera DVR Clock (4GB) to your Shopping Cart. Take ing to the next level with the World's Smallest Camera DVR Clock. The unnoticeable camera lens is completely hidden, so nobody will realize they're being recorded! Introducing the World's Smallest Camera DVR Clock: This is the first time so much technology has been packed into such a compact design. As one of the newest innovations in gear, the mini size and light weight of this mini camera lets you put it in your pocket and easily take with you anywhere. at home, the office, or even on-the-go. The built-in DVR captures around 2 hours of high quality video and comes complete with a microphone for all your covert surveillance needs. To completely avoid suspicion, this secret gadget looks and works just like a mechanical desk clock. With no wires, no sounds, and an undetectable hidden camera lens, nobody is the wiser so just away! 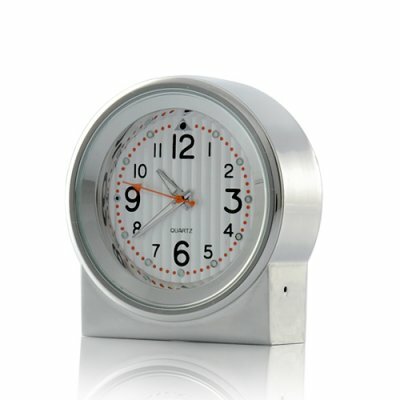 The inconspicuous design of the World's Smallest Camera DVR Clock makes it widely used in personal interviews, meetings, at home, at the office, as well as for all kinds of personal use. With easy one button recording, a high quality pinhole lens, and a super compact design, the World's Smallest Camera DVR Clock is sure to become a top selling item. If you are a reseller, this is a good chance to sell a unique device before anyone else. Place your orders now and we will express ship your order by tomorrow. And don’t forget, this gadget is backed by our famous 12 month warranty and is in stock now. Available only from the leaders in wholesale electronics and devices - Chinavasion! Why is the color on the videos a bit off? Make sure to peel off the protective layer on the face of the clock!